Egypt has suffered its worst extremist attack in modern history – on a mosque in Northern Sinai Province. 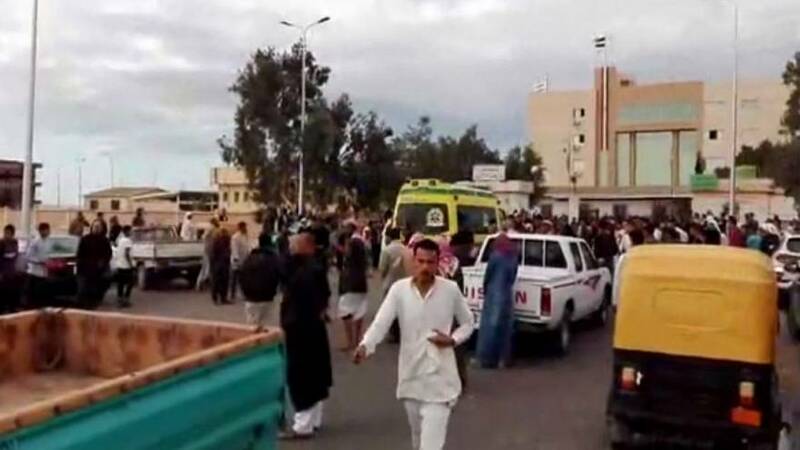 Reports now say at least 235 worshippers were killed and at least 109 wounded during Friday prayers at the mosque in Bir al-Abed town. The militants set off explosions and around forty gunmen then shot at worshippers as they fled the mosque and when ambulances arrived to treat the wounded they shot at them as well. President al Sisi declared three days of mourning and addressed the nation. The Sinai Region has been plagued by Islamist violence which has intensified in the last three years – Islamic State have stepped up attacks on police and the army, and killed hundreds of them. There are Islamist attacks almost daily on the security services but the attack on a mosque seems to be a change in strategy. In the past Islamists have also attacked local tribal groups whom they accuse of working with the security services. The Islamist insurgency was stepped up after Islamist President Mohammed Morsi was ousted by al-Sisi and the army in 2013. Al Arabiya channel has reported that some of the worshippers were Sufi Muslims who are regarded as unbelievers by extremist Islamist groups. Other reports said members of the security services worshipped at the mosque. Morsi was Egypt’s first democratically elected leader but his involvement with the Muslim Brotherhood was deemed unacceptable by the military. Militants are trying to expand beyond the sparsely populated Sinai, which is mostly desert, and they’ve managed to stage occasional but deadly attacks against Coptic Christians and their churches in Cairo as well as at a monastery in southern Egypt.